This post contains affiliate links. Thank you for supporting Seersucker Sass. It’s no secret that self-care is a trending topic in 2018. First there were the posts about bubble baths and face masks. Then there were the “opposition” posts about how self-care was so much more than bubble baths and face masks, and we should be focusing on therapy and mental health. 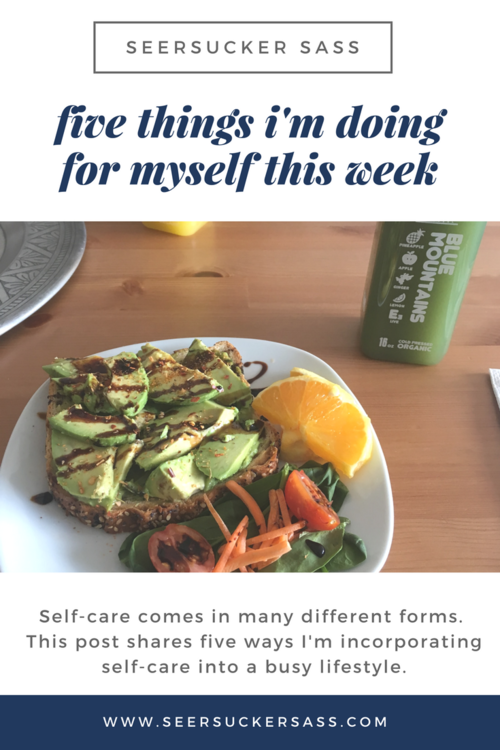 In my opinion, self-care not only looks a little differently for everyone, but it looks a little differently by the day. Some days, I need a really good ranting session with my girlfriends where I’m free to yell and get worked up and get it out of my system. Other days, I need to be on my yoga mat, sweating out my stress. And after a really long day, there’s nothing better than soaking in a hot bath and just enjoying the silence. Yesterday morning, I realized that I had some errands that couldn’t wait any longer. Nothing opened until noon, so instead of continuing to sit around and wait for the world to open, I left a little early and treated myself to a healthy breakfast at my favorite juice bar. While enjoying my avocado toast, I kept thinking about just how nice it felt to take a little time to do something for myself. So I made a list of five things I would do for myself this week. I’m sharing it not just for accountability, but also to encourage you to do the same. As we discussed before, self-care doesn’t have to be a face mask and it doesn’t have to be therapy. Self-care is whatever you need it to be that day. 1. Getting my eyebrows done. Yesterday, I took the time to have my brows threaded for the first time since January. A brow pencil is one of the few cosmetics I use on a daily basis, and it was to the point that even a brow pencil could not save them. Despite the fact that brow threading is not a painless experience, I felt like a new person walking out of the salon. Moving forward, I hope to prioritize taking pride in my appearance a little more, as it’s currently the first thing I’m willing to cut when I need more hours in a day. 2. Recording a “list of gratitude” throughout the day. Y’all, I cannot tell you how much this has rocked my Monday. Instead of giving something up for Lent, I decided to be more intentional about gratitude. [more about that here] Mondays can be rough, so I decided that this week, I would make a list of things throughout the day that I’m thankful for. So far, I’m really thankful that I can move my car because there is no longer a random washing machine sitting behind it (I know, seriously, WTF. #apartmentlife), I made it into the office before 8 AM, I have an amazing boss, and my new toner is working. It is crazy how differently I’m seeing my day now that I’m looking for the positives. 3. Working on a personal writing project. I love to write, and I’ve decided to write a work of fiction for fun. I don’t have intentions to publish it or really share it with anyone except a girlfriend or two, it’s just something that I’m doing to prove to myself that I can and to continue sharpening my writing skills. I started this weekend, and it’s crazy how much more inspired I’ve felt with blogging. I plan to dedicate a few hours this week strictly to working on this project. 5. Scheduling time to do nothing after work. This is a big step for me. I only have plans after work two days this week – one is a coffee meeting at a cafe that I love and one is dinner with my best girlfriend. I actually turned down a meeting this week because it would be occurring immediately after my annual skin check up, and I knew my body and mind would need time to rest afterwards. I want to hear from you – what are you going to do for yourself this week? Write it out, schedule it on your calendar, whatever you need to do, let’s make it happen! PS – If you pray, would you mind to send some prayers my way on Thursday? As I mentioned, I’ll be having my annual skin check up. I trust that it’s all part of God’s plan for my life, but prayers for calm nerves while potentially playing the waiting game and acceptance of the outcome are much appreciated. I am determined to make time for my friends this week (for me.) Day to day, I get so tied with my daily schedule that on weekends, I prefer to just relax alone or with my boyfriend. I really want to nourish my friendships more. great list!! doing something for yourself is always important! It's so important to do things for yourself! I hope you have a great week. I especially love your list of gratitude idea. Sounds like a productive week! Sending all the good vibes your way. I really need to make a gratitude list. I've been so stressed this week that I need more joy in my life! I've been thinking about writing something too – it would be so fun! These are so great! I personally have been tossing around the idea of a personal writing project (possibly self-publishing some already written work). But I will have to carve out some dedicated time for that. I love this list! You're so right that sometimes it feels so good to just take time to do something for yourself! Taking a bath and relaxing is my fave thing to do! 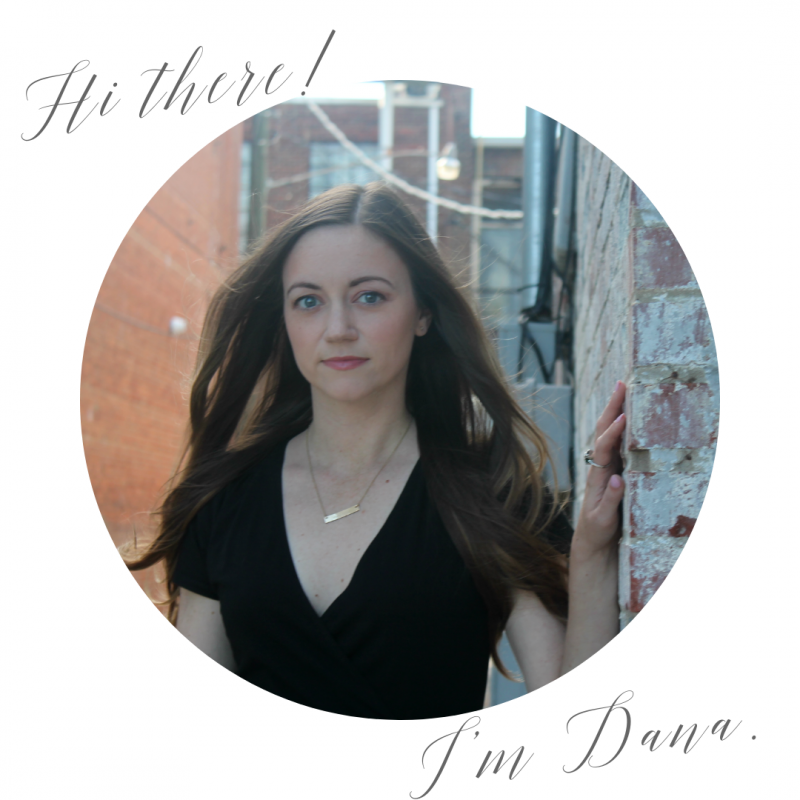 Great list… and a total reminder that I need to get my brows did too 😛 I love that you're writing fiction– I would love to write a book someday, I just need motivation to get started. Scheduling time to do nothing, why do I love that so much? Haha! mba online courses Incredible rundown… what's more, an aggregate update that I have to get my temples did as well 😛 I cherish that you're composing fiction- – I would love to compose a book sometime in the not so distant future, I simply require inspiration to begin.